Attleboro, 2 @ Canton, 4 – Final – Canton senior Jake Verille opened the scoring and junior Simon Cruz added two first half tallies as the Bulldogs led 3-0 at the halftime break. Attleboro junior Will Halben pulled one back but Canton’s Griffin Roach found the back of the week to make it 4-1. Brandon Lewis added a second strike for the Bombardiers. Mansfield, 0 @ Foxboro, 0 – Final – Mansfield senior Nick Ferraz made eight saves in net for the Hornets to earn the shutout. Franklin, 2 @ North Attleboro, 3 – Final – North Attleboro twice erased a one-goal deficit and scored the game winner with just two seconds left to open the season with two points. Franklin senior Connor O’Rourke put the Panthers ahead in the sixth minute, finishing a shot from distance. North tied the game in the 28th minute when junior Joe Hilf put home a rebound on a corner kick. An own goal put Franklin back ahead but North Attleboro tied the match in the 61st minute. Senior Gabe Pinhancos broke through in alone on goal, touched around the keeper and finished into the net. Hilf scored the winner at the death, putting his shot at the back post with two seconds left. King Philip, 1 @ Milford, 0 – Final – Milford pushed King Philip to the brink but the Warriors found the game-winner five just five minutes go. Senior Cam Koch provided the winner as his shot from outside the area hit off the crossbar and back off the keeper and into the net. Milford head coach Bryan Edwards played the effort of defender Joey Madden and goalie Josh Orellana. Taunton, 1 @ Sharon, 2 – Final – Liam Crowley put Taunton ahead just before halftime but the Eagles netted a pair of second half goals to grab two points. Marques Benton leveled the match in the 52nd minute, heading in a long throw from Tyler Hippler. Isaiah Stessman netted the winner in the 66th minute with a shot from distance. Canton, 2 @ Attleboro, 0 – Final – Lilah Sullivan scored off a Riley Duserick assist to open the scoring for the Bulldogs and freshman Elisa Diletizia added a debut goal for Canton. Attleboro coach Steve Santos said that his team played well and created chances, but just couldn’t find the finish. Foxboro, 1 @ Mansfield, 5 – Final – Click here for a recap o this game. North Attleboro, 0 @ Franklin, 3 – Final – Click here for a recap o this game. 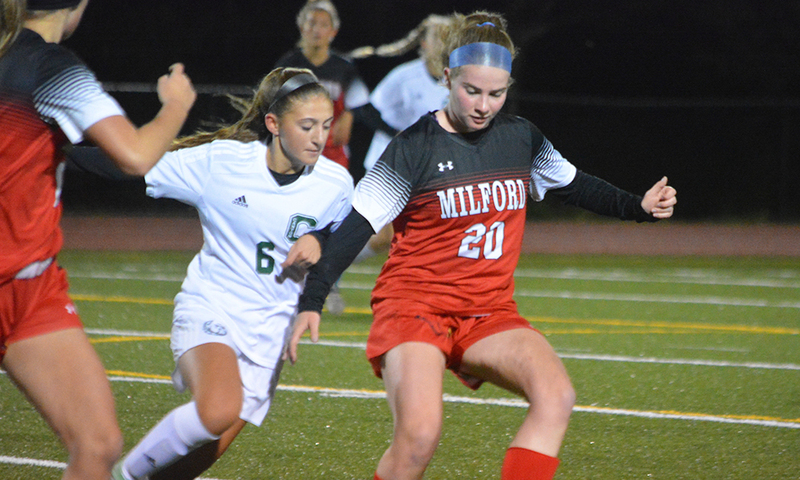 Milford, 0 @ King Philip, 4 – Final – Chloe Layne scored a pair of goals and had an assist as KP scored four goals for the second straight game. Layne opened the scoring off a corner and Jenny Hinch made it two by finishing off a loose ball to the near post. Avery Snead scored off a Layne assist to make it 3-0 at halftime. Layne redirected an Emma Corcoran corner for her second and the fourth for the Warriors. Milford goalie Olivia Marshall made eight saves and Hawks coach Jay Mastaj said that Rachel LeBlanc had a solid game on defense. Stoughton, 0 @ Oliver Ames, 3 – Final – Abby Reardon, Sofia Masciarelli, and Erin Homberg scored goals for the Tigers and Sophia Cox and Abby Hodges had assists. Stoughton coach Tara Daniels said it was a “well-fought game” by the Black Knights. She added that senior Mia Greene created a number of chances from center midfield and goalie Emma Harrington played tough in goal. Sharon, 0 @ Taunton, 2 – Final – Emily O’Gara had a goal and an assist for the Tigers. Maggie Sullivan had the other goal and Samantha Tichelaar had an assist. Grace Pimenta made three saves to earn the clean sheet. Attleboro, 1 @ Canton, 8 – Final – Canton senior Andrea McNeil netted a pair of goals and registered a pair of assists in the Bulldogs’ big win. Franklin, 1 @ North Attleboro, 1 – Final – Franklin freshman Victoria Quinn tied the game midway through the first half off an assist from freshman Amanda Lewandowski. 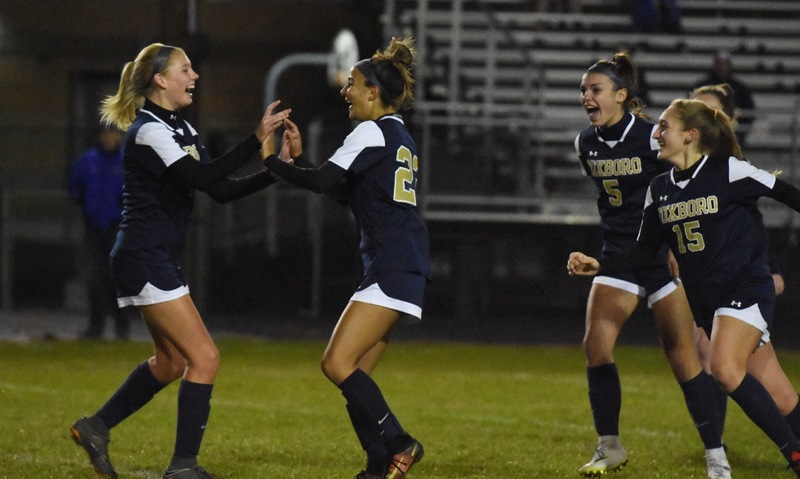 FHS goalie Christina Luccini helped the Panthers preserve the tie with a stellar second half, making five her of nine saves in the second half. Franklin head coach Lisa Cropper also praised the play of junior Cassi Ronan and senior defender Jolie Bua. Oliver Ames, 3 @ Stoughton, 2 – Final – Oliver Ames broke open a tie game at the half with a pair of second half goals to beat Stoughton. Liz Nuss led OA with two goals while Hannah Stryke scored one goal. Caitlin Grant recorded 11 saves in net for Oliver Ames. Haley Apotheker and Allie Howe scored for Stoughton. Taunton, 4 @ Sharon, 2 – Final – Taunton led 1-0 at the break and netted three more goals in the second half to pull away from Sharon and earn the win. Kya Enos scored a pair of goals while Diana Brend Lauren Torres each netted one goal for the Tigers. Senior Liana Duarte and freshman Alana Tavares each registered an assist in the win. Sharon head coach Andrea Vandette said goalie Lindsay Moses played an amazing first half, turning aside 20 shots. King Philip, 9 @ Milford, 0 – Final – King Philip raced out to a 6-0 lead in the first half and never looked back in a shutout win on the road. Alli Meehan had a hat trick and two assists to pace the Warriors’ offense while Claire Lawler scored twice and Caroline Klim had two helpers. Liz Furfari (goal, assist), Dana Truini and Raegan Simeone each scored once while Christina Hathaway and McKenzie Mazur each had one assist. Taunton, 0 vs. New Bedford, 3 – Final – Junior Kayli Fagan recorded 10 assists and Sam Reaume finished with four kills and a block for the Tigers. Attleboro, 172 @ Taunton, 189 – Final – Attleboro’s Kyle DelSignore led the Bombardiers with a low-round of 39 while Corey McKenna carded a 41 to lead Big Blue to its first win. Jack Giebel, Jack Patneaude, Cam Williams all shot 46 for Taunton. North Attleboro, 171 @ Milford, 172 – Final – North Attleboro’s Dylan Kane earned match medalist honors, carding a low-round of 38 to lead the Rocketeers. Riley Lynch led Milford with a 40 and Will Middlecoat shot a 42. King Philip, 168 @ Franklin, 171 – Final – King Philip’s Danny McLaughlin was the medalist with a low-round of 37.